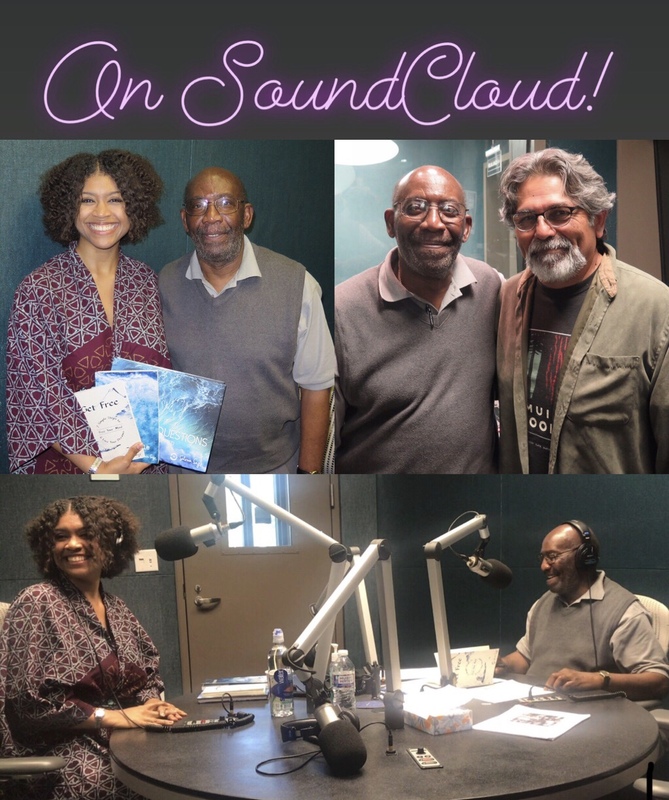 Yesterday, it was a privilege for me to be on air with legendary Mr. John Hanson on “In Black America” at KUT Austin, Texas — the longest running Black radio station in America! 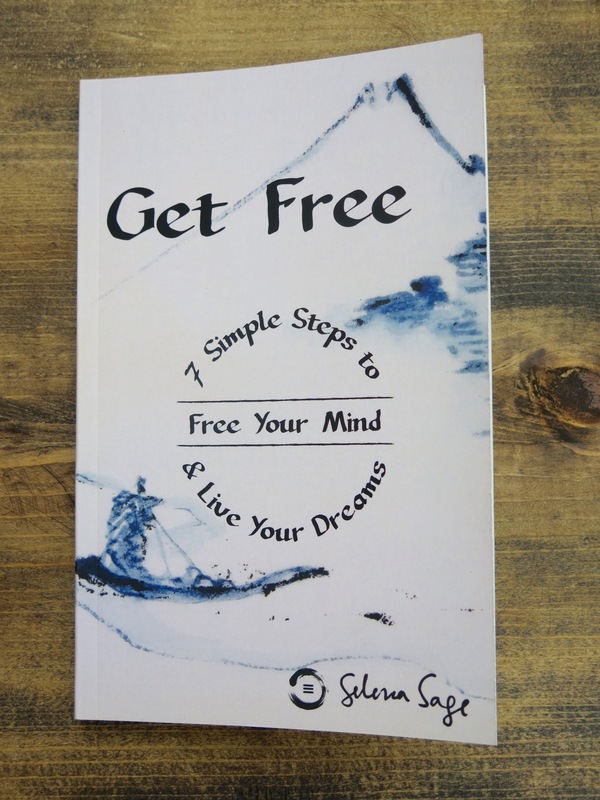 On the show, we discussed my latest book, “Get Free: 7 Simple Steps to Free Your Mind & Live Your Dreams” and my journey from growing up in Austin to living abroad on a remote island in Africa. Since Mr. Hanson has known me since I was a toddler (smile! ), I thought that our discussion was particularly engaging and insightful. I am so thankful for the opportunity and I enjoyed meeting the amazing KUT team! Special thanks to John Hanson, David Alvarez (Production Manager), and Chelsea for being so welcoming! It is always wonderful being back in my hometown, and I continue to be thankful for all of the love, good vibes, and laughs!! It truly is food for my soul, and I am so thankful. P.S. Happy Birthday, Mom! ;) I love you! 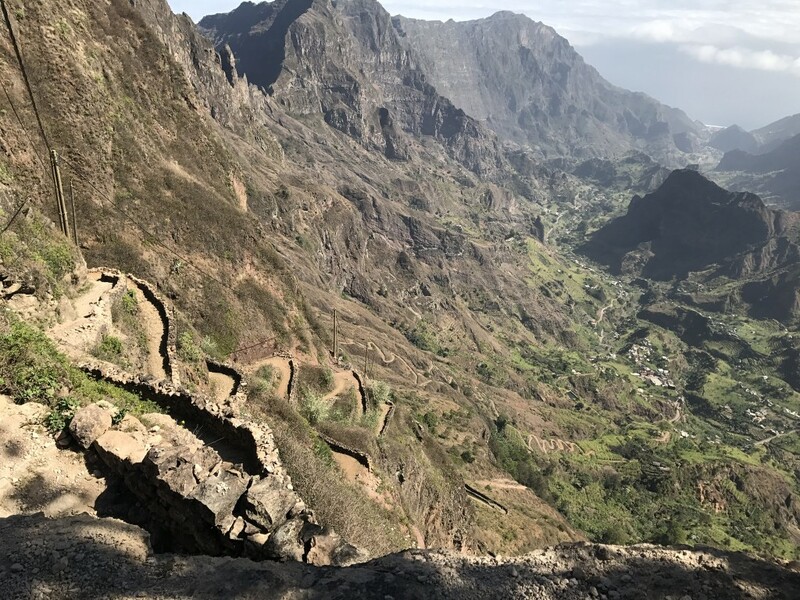 I have been traveling (around the world) for almost a year straight, and it is hard to put into words what that feels like. While the experiences, people, and places have been great, my body has reminded me of the importance of rest. 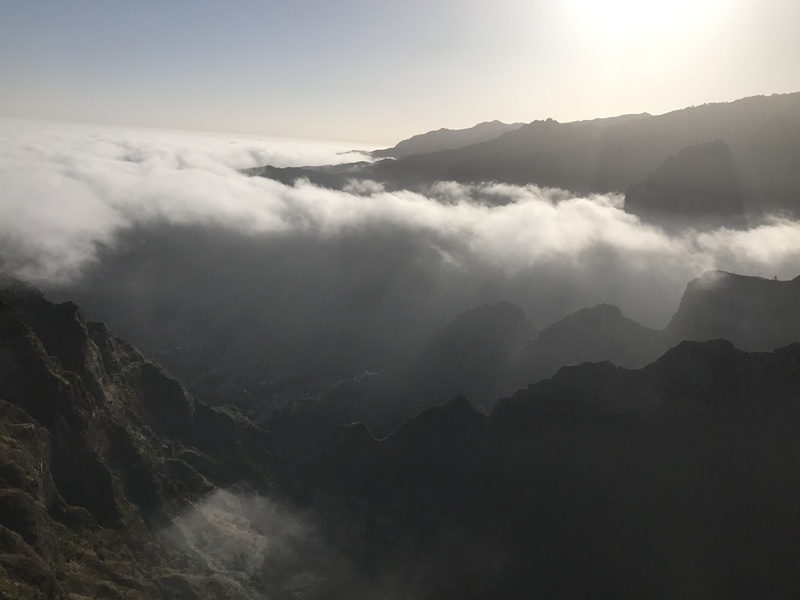 While I feel the excitement of new things on the horizon, it sometimes feels like I’m in the clouds. Personhood tells me to pick a path, spirit tells me to relax and know that the path will come to me. Even in these moments of seeming indecision, I know that grace shines upon me. I am ever thankful for all of my blessings of abundance, and I shift my consciousness into the space of awareness, knowing that all is well. In this space, more than any other, I know that rest is the greatest gift. All is well, and all will be well. Life takes care of life…and for that, I am immensely grateful. Being in Austin, Texas—my hometown!—is always a joy. Having the opportunity to spend time with my family is a beautiful gift. I originally came to Houston with the idea that I would be here just a few weeks ago…but that was almost three months ago! A series of (fortunate) events have kept me here and it’s been a really beautiful experience. I’ve met so many wonderful, beautiful people! 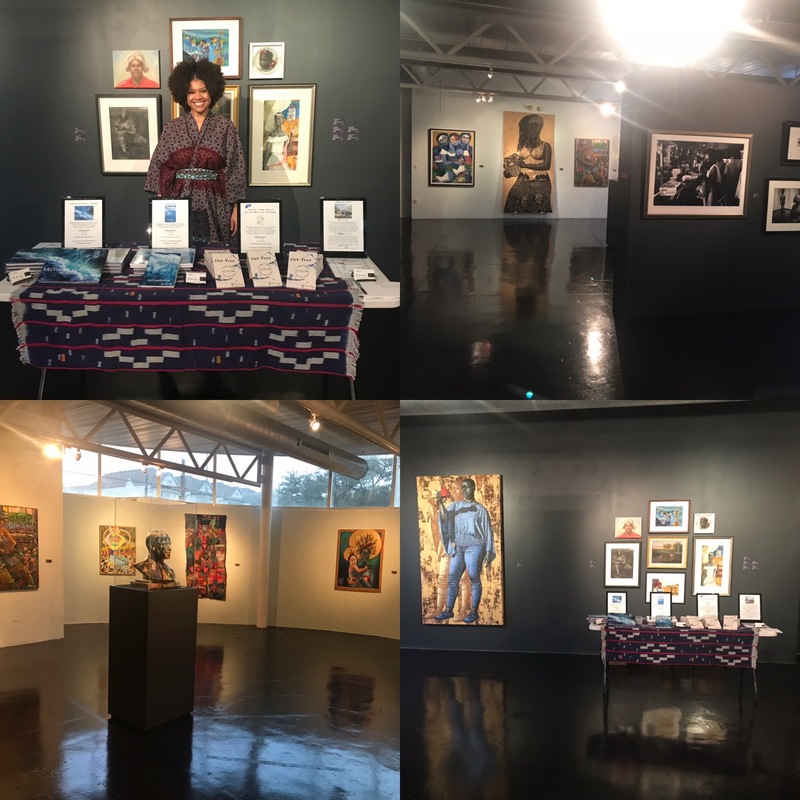 And it’s been a delight for me to share my books with beautiful beings here, through events that have just sort of come up! 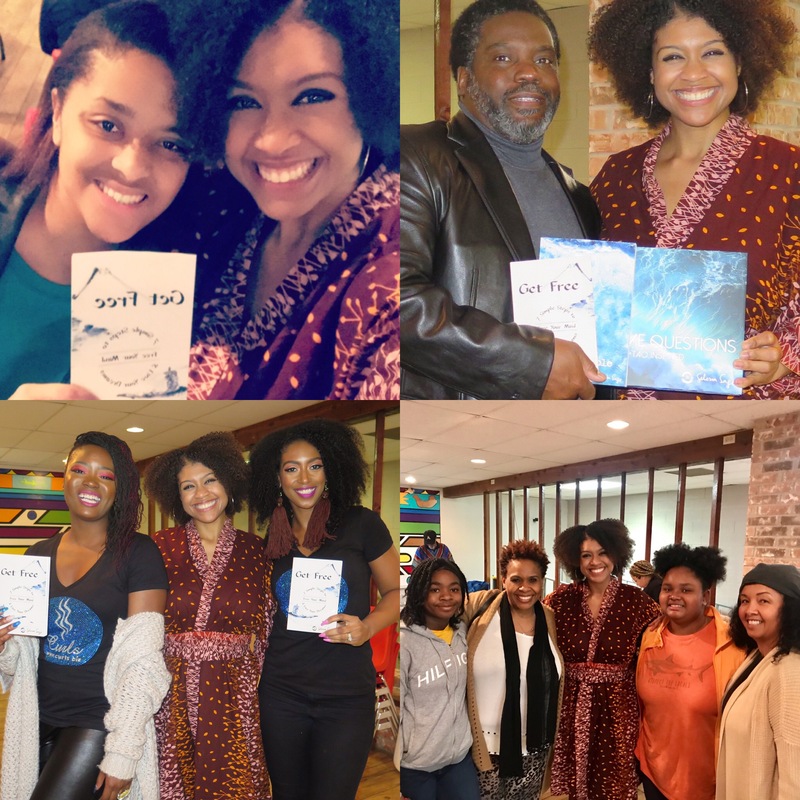 As an independent artist, with an independent publishing company (that I created — ZenTao Books), taking a book from idea to finished product is a complete rollercoaster! Believing in an idea enough to commit to it, and then continuing forward through various doubts (will anyone gain something from this?! ), fears (will I run out of money making this?! ), perfectionist-based-worries (will I ever get this cover right?! ), and external realities is a lot! It’s something that I think all creatives go through, and it’s one of the reasons why I try to support other creatives that I meet (even still, I sometimes have the next-day worry that perhaps I should have done more, but that is impractical and impossible, so it’s a thought I let wash away). There are a host of costs that go into creating art (for a book, this can include design fees, licenses for cover art, websites, copyright fees, ISBNs, printing, etc.) and sometimes it can seem overwhelming for an independent artist (who typically pays for these fees out of their own pocket!). But I can say that everyone who takes time to even look at the art and say a kind word is watering an artist. Those who feel inspired to go the extra step to purchase the art is like the sun…not only are they paying the highest compliment possible to an artist, they are also helping the artist to cover costs for the art that has been created AND they are helping provide a pathway (spiritually and financially) for the artist to make more art. This is all a beautiful exchange of love and energy. So, as you consider supporting an independent artist, I can only invite you to see your purchase as adding water and sunlight to a flower. Even if you don’t fully vibrate with what you’re seeing, perhaps you have a peek at a flower early in bloom and you can see the beauty that is unfolding. Your watering will help that flowering, and perhaps you know someone who will appreciate that stage of the bloom. Gifting independently made art is a dual gift that is based in love. To all, I give my sincere thanks! You are my sun and rain and I thank you for cheering me on as I continue to grow! I keep a picture of the moment just before I met Mooji as the background art on my mobile phone. I do that because I want to keep that beautiful memory alive in my consciousness. It was so profound, but even still, life creates new memories that can push old ones down. 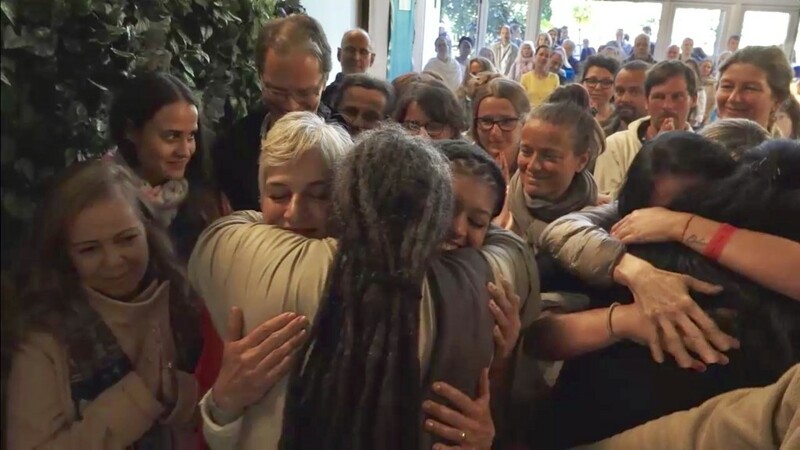 During my first time meeting Mooji in Satsang, I felt profound shifts in my understanding, but even that did not prepare me for what it would be like to meet him! As I waited patiently along a rail, near the end of his path, where he would exit the hall, I held a copy of “Meditative Questions” that I had signed for him, and planned to gift him. As he came nearer to where I was standing, I heard people spontaneously start to cry or laugh, and I felt myself smiling without any reason. As he came closer, I felt everything around me slowly drop away. 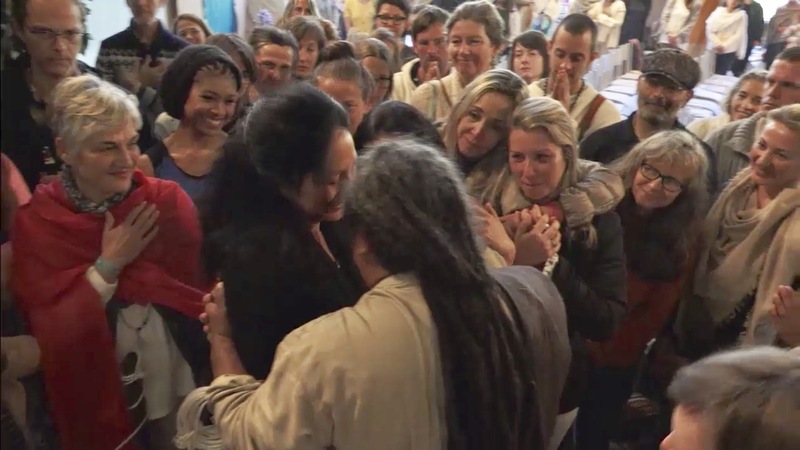 When Mooji reached out to hug me, absolutely everything dropped away and I felt an immense light shining within myself. Mooji presented as an endless and infinity source…of what? I can’t describe. I have never met anyone remotely close to Mooji’s being, but I love that his teachings point the way for others to join him in the infinite. As I thought this morning about meeting Mooji, I thought back to how it was said that Christ healed the sick and helped the blind to see. When I was a child, I imagined Christ as a magical figure (I still do!) who had kind of imparted magic when he touched people and healed all. As I think of Mooji, I see it a little differently. While I still think of him as magical, I think that his pointings bring everyone to WHOLENESS. In reflecting on my experience meeting him, absolutely every care and worry dropped away. If I had been sick, I would not have been in that moment. If I had been blind, the seeing he provided would have been internal…it was an emptying that, through removing everything, all could be seen. My understanding of that experience still comes in waves, as does my awakening. Through Mooji, I have experienced THAT which cannot be seen…and I continue to absorb his lesson that I AM THAT. 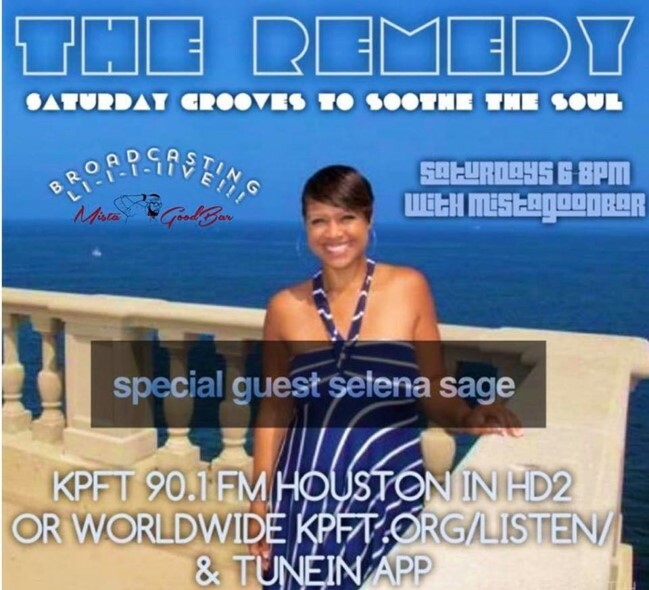 Yesterday, I had the most amazing time chatting with MistaGoodBar at The Remedy (KPFT Houston)! Please click here for the full interview. If you listened and enjoyed this interview, please know that independent artists and radio stations depend on public support to cover costs and continue to provide a platform. Please support the books however you can (amazon.com/author/selenasage for physical books or zentaobooks.com for special $4.99 sale on ebooks of all titles! If you think one of the books might be great for a friend, thank you for the support by either gifting or sharing links to the books! eBooks are .pdf to be read on every platform, and they are shareable!). Also, please join me in supporting The Remedy Radio by dropping a donation (any amount is okay!) to CashApp $KPFTHouston or pledge.kpft.org and please note that you are donating in support of The Remedy. Being at the event also caused me to remember the fact that I’m actually an entrepreneur! Haha I sometimes forget that my publishing company, ZenTao Books, is an actual entity because it actually just feels like an extension of myself. After I wrote my first book, I did not imagine that I’d be releasing a book every two years after that (2015, 2017, 2019)! And given the realities of supporting the design and publishing costs, I’m being pulled into a broader vision. 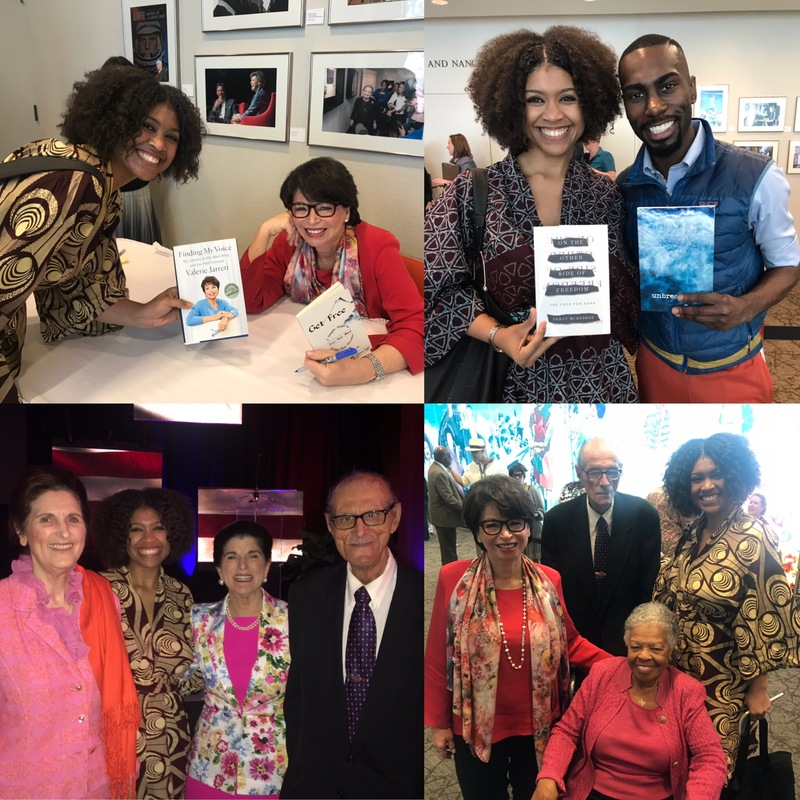 Launching a new book is exciting and overwhelming! There are so many details to consider, websites to update, and outlets to market to. Sometimes it seems that the tasks will never be done! But step-by-step, and bit-by-bit, everything gets done through determined persistence. There are endless ways to launch a book, but I find that I’m forced to just do what I can—simply to get it done. The perfectionist in me is forced to take a back seat to allow progress to be made. I recognize that by putting the book out there, the opportunities will show up at the right time. 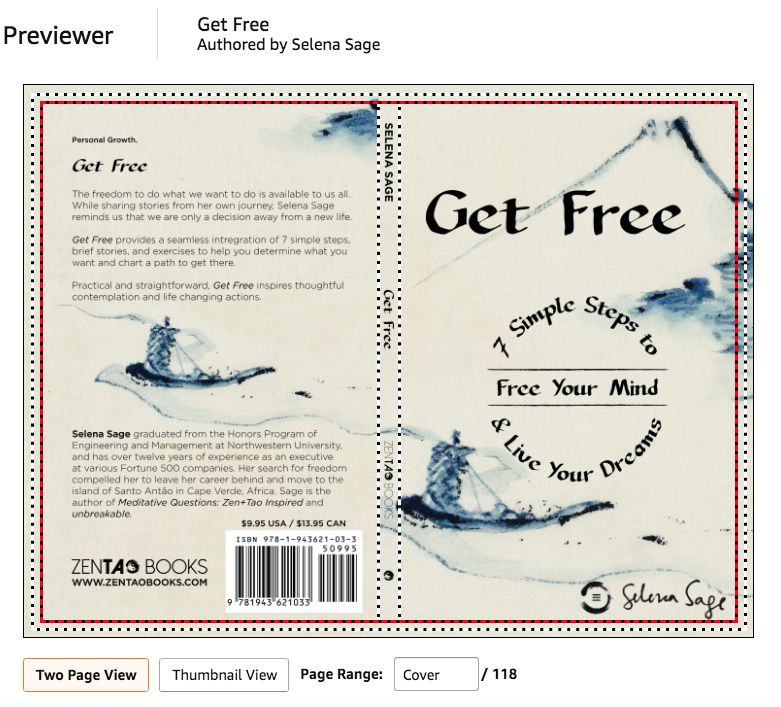 Get Free was designed to be a transformational tool to examine your own life and prioritize your dreams. Through sharing brief stories from my own journey (from corporate life to an island in Africa! ), and exercises for completion, Get Free invites the reader to take the spark of inspiration from each step and apply it to their life. Get Free eBook in pdf format is available here. Get Free paperback version is available through Amazon.com here. When I notice a minor typo in an email I’ve just sent, I have to continually tell myself to let it go. When I find a typo in a social media post, I immediately edit it. These things don’t really matter, but I still want to get them right. I think about these small mistakes longer than I should, and I chastise myself for not checking twice. However, these digital mistakes pale in comparison to my quest for perfection when publishing a new book. When organizing a new book, I agonize over every space and every font. I want the pages and words to be perfect, so that errors do not distract from what I am trying to say. I feel physical pain when I’ve fallen short of that goal, but I also feel euphoric when I feel like I’ve gotten it right. I’ll be the first to say that this is all insanity, but I delight in things don’t right, so I’ve had to accept this quirk about myself. In this moment, I can say that perfection feels like an addiction–just a little more change and it will be okay. But I know deep within that there has to be a stopping point to the process of endless changes to move forward. Thankfully, I’ve experienced this with my previous two books, so I know that I can do it. Those books were designed to be more artistic…with centered text and lots of empty space, so there was less to worry about with margins and paragraphs. (Even still, I was crazy about spacing and centering then haha) Get Free brings unique challenges because it is more of a traditional book, with paragraphs, chapters, and a table of contents. I also made the late choice to change the font of the book, which resulted in some additional challenges within spacing/format in InDesign (software I used to layout the book). I’m thankful for my keen eye and quest to get things right, but I’m also very aware that there is a fine line between perfection and insanity. I think of the quote, “Perfection is the enemy of greatness,” and I know deep down that sometimes we have to be brave enough to say this is wonderful and beautiful as it is…even if a line has spacing that isn’t perfect. Wishing you space to breathe through perceived mistakes as you release your art into the world. Mistakes happen, and they are correctable. What you are sharing is bigger than the small reasons that may be keeping you from doing so. Namaste. Note: My tweaks to the internal text today (InDesign) were formatting changes that (I felt) were needed as a result of changing the font within the book. 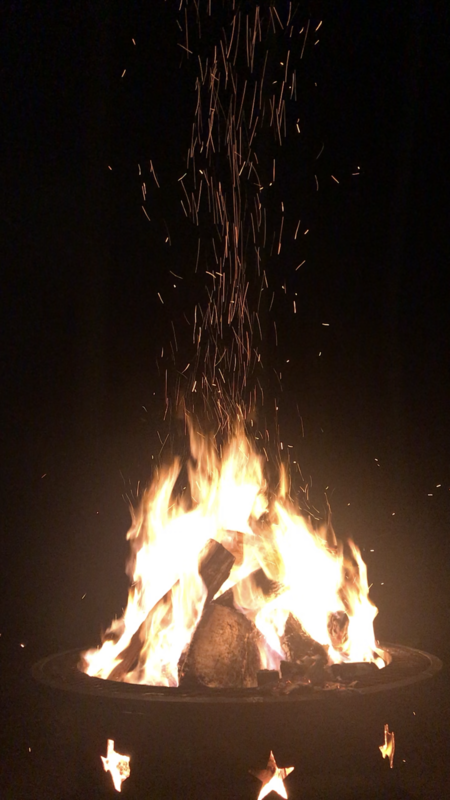 As we enter a new year, let us burn all of the doubts, fears, and anxieties that we felt in 2018. Let us celebrate our resilience as we overcame all that threatened to tear us down in the days past… and may we recognize that, like a phoenix, we continue to rise from the ashes of all that we’ve left behind. New years are simply markers of time that encourage us to take a moment to recollect times spent in the previous year, and make plans for the next year. In our recollections, let us look with gratitude for all of our experiences and let us recognize our own growth. As we move forward, let it be with a spirit of gratitude and excitement for all of the goodness that will continue to manifest in our grateful hearts. Today, I am reminded of Mooji’s wise words that “life takes care of life,” and I am humbled with deep gratitude for the many ways that I was taken care of in 2018. I am thankful for you. I choose to keep hope in my heart for all of the beautiful things to come in 2019, and I wish you peace, prosperity, freedom, and joy in the days and years to come.